Supreme Master Ching Hai also gave Chantal US$1,000 and US$2,000 to her family. 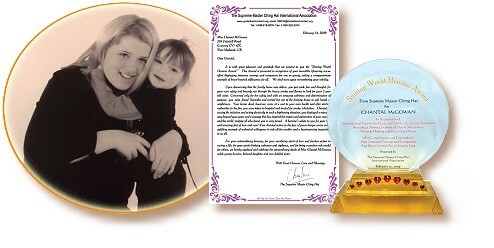 Chantal wrote a touching letter to Master, expressing her own and her mother Tina’s gratitude and appreciation for the “beautiful” Award, and all the gifts they have received. 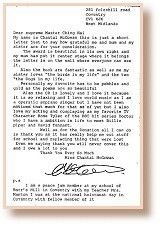 She said, “The books are fantastic, as well as me my sister loves The Birds in My Life and The Dogs in my Life…personally my favorite has to be Pebbles and Gold as the poems are so beautiful… Also the CD is lovely and I love it because it is so relaxing and I love world music as I am an operatic soprano singer.” She added that Master’s financial contribution has really helped her out with buying stuff for school and replaced things lost to the fire. We wish the brave and loving Chantal all the very best for the future and may God bless her always.